The current hunter safety license requirement employed by a growing number of states has several flaws, but the most noticeable is age discrimination. In Idaho, for instance, if you were born after 1975 you must present proof of passing a hunter ed. class. So essentially an Iowa farm boy born after 1975, who has been hunting and fishing his whole life must spend a weekend in school. (Ed. note: Don't get me wrong, I think hunter safety classes are a great check and should be required of everyone.) Meanwhile the president of the Humane Society, who has about as much experience with hunting as I do with Star Trek conventions, could saunter up to the counter at a sporting goods store and buy a license, no questions asked. Who would you rather have in the woods: the twentysomething country boy, or an older fella with no clue? And all of this leads to the week's news. Ohio figured out a way to get greenhorns into a deer stand without requiring the hunter safety certificate up front. How? With a new apprentice license program. The way it works is first-time sportsmen, accompanied by a fully-licensed hunter, may "test" the sport out. If they enjoy it, then they take the class and become certified. This is a great way to hurdle a block that keeps many guys out of the wild. In a perfect world, Ohio will develop a mentor system along with this new program. Hunters could volunteer to take newbies afield maybe in exchange for a free license. This is not a reference to an SEC football game, but there’s probably just as much alcohol involved. Several men in south Florida were busted on a Seminole Indian reservation for setting up fights between wild boars and dogs. The bouts lasted 60 seonds and were held in small pens between pit bull terriers or bulldogs and a wild pig. According to a Humane Society spokesman, this "blood sport" has been going on for at least 25 years. In response to the arrests, the owner of the operation told the AP that she believed the cops were acting at the behest of animal rights activists. 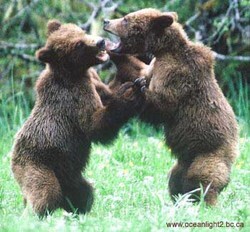 So I got to thinking, when it comes to hunting I'll steer clear of bear-hugging antis like they were a radiation leak. As for food issues, such as demanding corporate farms to raise chickens in decent conditions (read: not in cages where they can't spread their wings), I can understand the Humane Society's argument. What do you think? Is there common ground for animal rights organizations and hunters? Christo and Jeanne-Claude are proposing to cover 8 miles of the Arkansas River in drapery. Oh, and call it art. The Bureau of Land Management is soliciting opinions on the "Over the River" project before deciding whether or not to grant permits. The person to contact is the field office director Roy Masinton. Comments must be submitted by February 10. If you do send an email be sure to include some art criticism of Christo's past projects. We don't want to seem uncultured, after all. Christo is the fella that put up the "Gates" exhibit in Central Park last winter. His mission was to lighten the mood of an otherwise gray and dreary winter. Instead it looked like a giant road construction project. But that's just my opinion, which reminds me of some advice from a friend, "Always call yourself an artist. No one can disprove you." According to their website, the couple spent several years traversing the Rocky Mountain Range looking for the perfect stream to cover in sheets of fabric. They settled on the Arkansas River in Colorado because it has high banks and a road follows long expanses. Christo doesn't have the best environmental record with his project, and though he claims that the materials will not harm the surroundings, I don't think he can claim to be a river scientist. What happens when stretches of the river will be shrouded from sunlight during a peak season for insect hatches? And, in turn, how will the fish population react? These are issues that need to be brought to the BLM's attention. Also, will increased visitation damage the river banks or cause erosion? A press release from the ArkAnglers says not to bother making fun of Christo's past work or questioning whether "Over the River" is art or not. Though these statements are funny, I'm sure, they don't have any bearing on the decision-making. So where did I go? I've been in California at the Tejon Ranch conducting the 2006 Optics Test for the magazine. Bill McRae our unflagging eye expert led us through the routine and proved yet again why he is the source for hunting optics. I've posted several photos from the trip, so take a look. Hopefully this week I'll get the video feature to work, so you, can get a talking to from Mr. McRae. So, most hunters are of the red-state mentality...or so say the polls. This story is a great read on how liberal politicians might have a better solution to the future of hunting than conservatives. Hopefully I'll have more time to post on this later. percent sales increase in 2004 to $1.9 billion, according to the report. up 1.9 percent and air gun sales ($120 million) rose 3 percent. Nothing like a press release for new outdoor toys to get me excited for deer season. This time, trail cams go online. A new product called the Primal Vision IR sends digital images from a trail cam to the Internet via cell signals. The owner is then alerted when new images arrive by email. This takes the legwork out of the scouting equation. Set the camera up and then watch from work as big bucks do their best centerfold poses. I wonder about the photo sharing capabilities online. If you could set up a profile-based platform like Flickr or SnapFish, then you could have a community of trail cam users that can compare one another's images. It'd be pretty cool to see what kind of deer were strutting around a friend's farm in Iowa, if I'm stuck in New York. When the press release hit our desk, there was a collective jaw dropping by us editors. U.S. Repeating Arms Company, which owns Winchester, announced that it would be closing their New Haven, Conn., facility on March 31. Along with this shocker is news that Winchester models 70, 94 and 1300 will cease production. Winchester Firearms will continue to see and grow its current line of Select over & under shotguns, the new Super X3 autoloading shotgun, the new Super X autoloading rifle and Limited Edition rifles. The company also plans to introduce new models in the future. There will be no change in Customer Service. The good thing about the Internet is that a quick google search reminds me that I'm a completely normal person. Unfortunately, I'm reminded of this by evidence of the insanity of others. It's also nice when these folks take time away from their role playing games to give us a web gem. Come St. Agnes Day (whenever that is) the mythical beast hunting season begins, or so says a webpage from Lake Superior State University. This site is as detailed as any DNR homepage and outlines everything you need to know for your unicorn season (What? Only one per month? Those things are as common as squirrels.) Hunters will be happy to find that since it's an even year (2006, remember? ), you'll be allowed to hunt the southeast rim of the Milky Way. Conservationists should celebrate as federal officials begin the process of removing the Grizzly bears in and around Yellowstone from endangered species protection. The move will shift management responsibilities from the feds to the state of Wyoming. This means a limited hunting season could be on the horizon. I wrote a short post recently on the Endangered Species Act, and here is one of the rare success stories. Of course, the biggest obstacle to beginning a hunt will be public outcry. The same people that watch bears from cars on the roads of Yellowstone, feed them junk food and otherwise intefere with habitat will almost certainly claim that a bear hunt will destroy the fragile species. Pish posh. Having followed the New Jersey bear debacle for the last three years, it's pretty obvious that hunter's don't have a negative impact on animals that are deemed "huntable" by wildlife officials. In fact, my bet would be that the incidents of bear attacks/encounters will be drastically reduced when a few hunters take to the mountains. Speaking of which, one of our editors here was charged by a grizzly during a deer hunt in Alaska. I'll be posting his exclusive report on the website this week. Just hearing him tell the story will make you need a new pair of underwear. Back to the OL homepage.